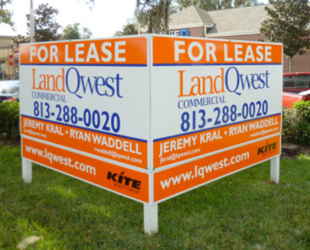 Install one of our site signs in front of your business, construction or real estate location and start getting the looks and attention that you need to get customers in your door, on your phone or checking out the property that you have for sale. posting one of our high-quality site signs. Call 813-447-4770 for full pricing details. If you're looking for durable, superior grade signs at reasonable prices, you need look no further. We offer custom storefront, construction and commercial real estate property signs that will get you noticed without breaking the bank. 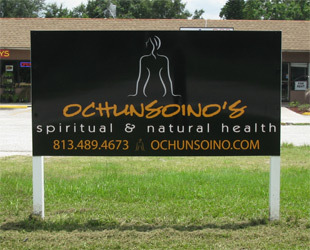 Our custom site signs are available in Any size, any shape. Installation services are available to customers whose signs will be installed anywhere within a 30 mile radius of our store location in Tampa, Florida. Distances further than 30 miles will incur additional costs. We have white posts to mount your signs, and we also have a selection of caps and finials that you may add to provide a professional finishing touch to the completed installation. 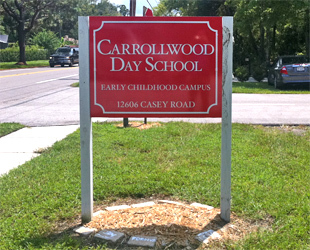 We use Max-metal, alumacorr, and MDO Plywood panels to create our site signs, and they are top-notch and durable. 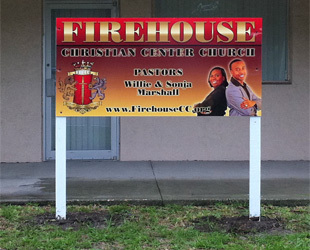 These signs are built to withstand dents and dings and exposure to the elements. And they are base painted with a white so bright that they produce unmatchable, high-end print results. For those of you on a more restricted budget, we do have another material option, which is 10 millimeter corrugated plastic. Our corrugated plastic panel signs are available in the same sizes as our aluminum composite signs, and they are also available for both single and doubled sided printing. Regardless of whether you choose wood, aluminum composite, or corrugated plastic to construct your sign, each of the site signs that we design and produce are laminated to add extra protection against water damage and the sun's ultraviolet rays. You don't need big bucks to make a big statement. 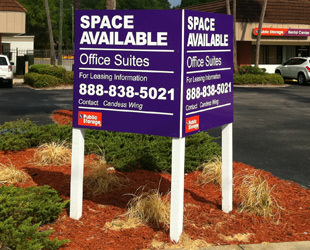 Our premium grade site signs are available at an affordable cost. Erecting one of our site signs at your construction or landscaping site will not only get you noticed, but also allow people to take note of the quality of your work. It is a sign that can speak not only of your presence in a particular location but also of the skill and craftsmanship that you invest into your work. For storefronts, installing an eye-catching customized sign in front of your place of business will help get the attention of potential customers or the people in need of your services. You can come in with your own designs or work with one of our seasoned graphic artists to come up with a design that's right for you and your business. We provide free quote and mock up services, so you will have an idea from the onset how your sign will look when it's completed and the total costs associated with producing it. Our dedicated marketing, designing and printing specialists are here to serve you with high-end, quality site signs at competitive prices. We boast one of the fastest turnaround times in Tampa Bay because we have the know-how, skill and equipment gathered all under one roof. So, if you need to spread the word about your skills, products or services, give us a call, and we'll get your marketing campaign underway in no time at all. 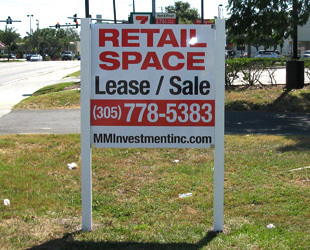 We provide site signs in Tampa, Florida as well as St. Petersburg, Clearwater, Largo, Palm Harbor, Brandon, New Port Richey and throughout Tampa Bay.